Half Robe or Jacket: How Do You Wear One? What Cheer Day is coming, and I hate to miss an opportunity to make a new gown (despite having just made one, and despite needing to make some waistcoats and trousers for the event). While I lay awake last night, I pondered my options, and whether a half gown would be suitable. Although I have concluded it probably is not, I was curious about how these should be worn. Where can you wear such a garment? Is it only suitable for at-home use? This is the robe from Nancy Bradfield’s Costume in Detail, replicated by Koshka the Cat here, and approximately by me, here. There’s a lot to love in this image, even with its fuzzy “between 1800 and 1811” date. Not only do we get an array of reading material (Novels, Romance, Sermons, Tales, Voyages & Travels, Plays), we get costume tips and– special bonus– a dog gnawing its leg. We also get a chemisette on the lady at the counter, along with a very dashing hat, a fancy tiered necklace on the lady in pink, who also carries a green…umbrella? Parasol? With just a veil, that seems likelier than the longest reticule ever. I like our Lady in a Half-Robe and her deep-brimmed bonnet showing curls at her brow. She and her companions show the range of white and not-white clothing seen in early 19th century fashion plates, and the range of head wear, too. The last question I’m asking myself, though, is whether the yellow garment is a half-robe or a short pelisse or a jacket. And can you wear a half robe out of doors? And what did the ladies of the period call that garment? In this fashion plate (featured by Bradfield on page 84, found by me at the Museum of London), the lady on the right is certainly wearing a short upper body garment, and I’d wager that she’s out of doors or headed that way, since she’s carrying a (green) parasol. Bradfield calls her garment a “jacket,” and until I can find the text of the Ladies’ Monthly Museum for August 1799, perhaps that is the term we should use instead. While two images aren’t a lot of evidence, it does appear possible to wear a half-robe or jacket out of doors for informal visits in clement weather, and finding two is as good a reason as any to look for more. that bottom fashion plated is described as Undress, so from what I undererstand that’s informal/casual clothing. from the page here (though I’d like to see the source of this information cited) and it’s UK so possibly also their colonies ie where I live, but not necessarily the USA. It is about the citation, isn’t it? It seems simple enough, but as I ponder the social nuances that were so easy for the people in the past to read and so hard for us, I’m still left with more questions! Is the woman in the Cruikshank wearing walking dress? That makes more sense than undress, even if walking-dress is a form of undress, as in not dressed. (Phew!) The buttons also make me think it’s walking dress, but I suppose that could vary depending on the date, which is so vague at 1800-1811. For now, I’m sticking to gowns. I love the half-robe/jacket concept in form and in practice, but I don’t feel confident yet that I know how to wear them in the early Federal/Regency period, or in 1760-1780. Always more to read. 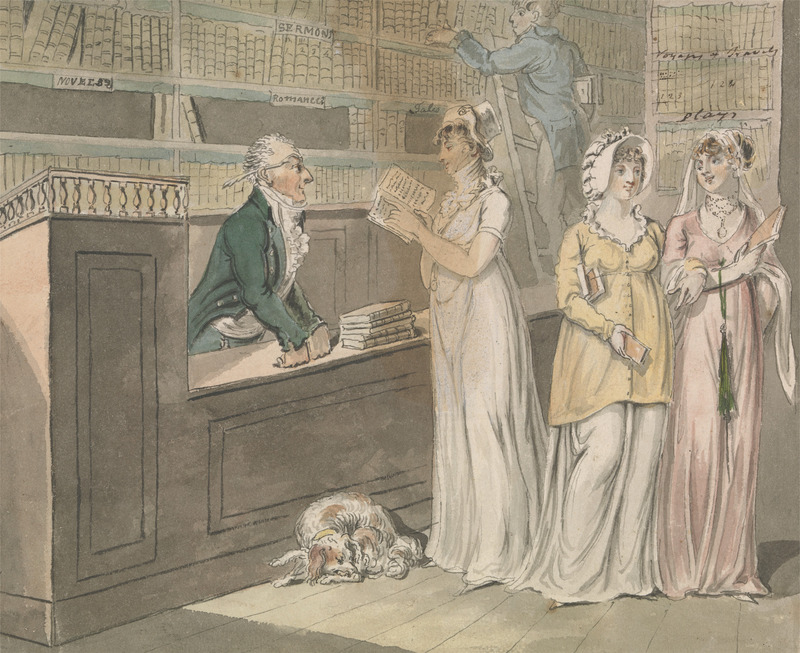 Let’s hope I can find something– a simple place to start might be to do a serious line up of fashion plates by level of dress, and then to try to correlate them with extant garments and period descriptions in literature or personal accounts. That might also help narrow the date of the Cruikshank a little bit. When I get the time, whichI hope to have more of once the kid is in the swing of school.